The Resident and 9-1-1 air back-to-back on Fox on Monday nights. 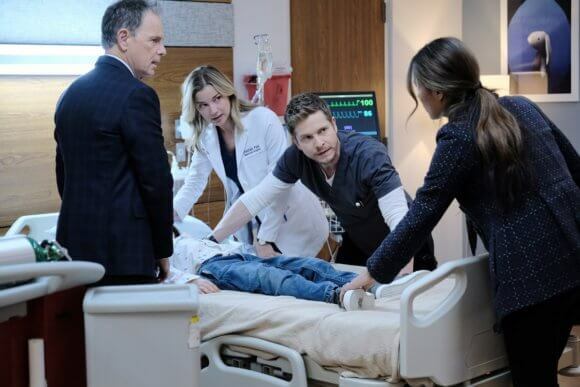 The Resident has been drawing in 11 million viewers on average during its second season. 9-1-1 has been pulling in an average of 15.4 million viewers over season two. According to Fox, 9-1-1 is their #1 drama and is among the top 10 entertainment programs with adults ages 18 to 49 this season. Season two of The Resident stars Matt Czuchry as Conrad Hawkins, Bruce Greenwood as Dr. Randolph Bell, Emily VanCamp as Nicolette, and Manish Dayal as Devon Pravesh. Shaunette Renée Wilson is Mina Okafor, Malcolm-Jamal Warner is Dr. AJ Austin, Jane Leeves is Dr. Kit Voss, and Glenn Morshower plays Marshall Winthrop. 9-1-1 season two features Angela Bassett as Athena Grant, Peter Krause as Bobby Nash, and Jennifer Love Hewitt as Maddie Kendall. Oliver Stark plays Evan “Buck” Buckley, Aisha Hinds is Henrietta “Hen” Wilson, Kenneth Choi is Howie “Chimney” Han, Rockmond Dunbar is Michael Grant, and Ryan Guzman plays Eddie Diaz.